Above is the 17th par three at Quail Hollow Golf Club, Charlotte, NC, site of the famous Wells Fargo Golf Championship. Charlotte Golf has four seasons mild enough for year around golf, and some of the finest golf courses in North Carolina. 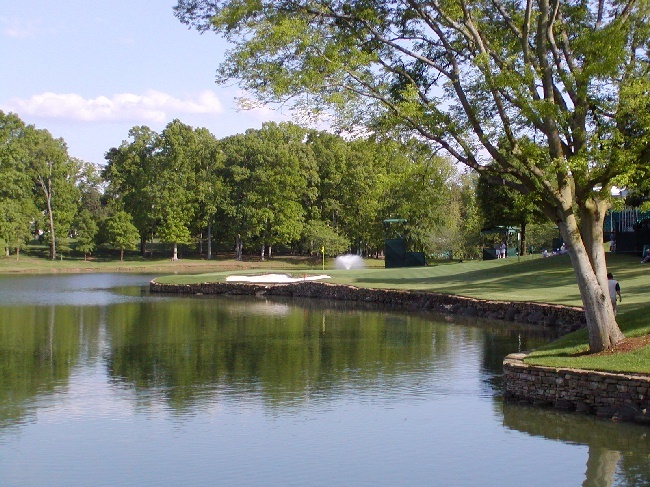 Here there are 53 public challenging, championship Charlotte golf courses designed by architects such as Donald Ross, Ron Garl, Arnold Palmer, and Jack Nicholas. Charlotte golf courses have been drawing discriminating golfers to Charlotte Golf for years. Here is a list of private Charlotte golf clubs. Charlotte golf travel plans can be research on this site by checking out the sites listed above for each course and using any available 4 for 3 Golf deals listed above. Set your Charlotte golf lodging requirements by using the hotel finder on the side bar for the best rates. Or you may enter your golf vacation requirements into the Charlotte Golf Package. If you want to stay in downtown Charlotte you should consider Downtown Charlotte Hotels as your reliable guide. Drive here using Interstate 77 or I85. Or fly directly into the Charlotte International Airport (CLT). Advertise here to reach Charlotte golfers. Ireland, Scotland, Wales, and UK Golf Vacations.